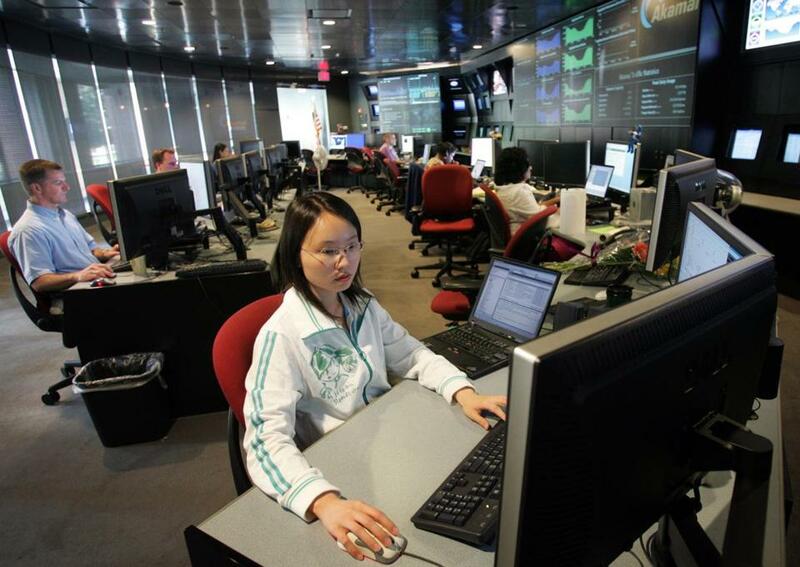 In this 2006 file photo, Eva Chan studied her screen at Akamai Technologies Inc. in Cambridge. Akamai Technologies Inc. will move into a new 19-story building in Kendall Square and is seeking a state tax break in return for keeping its workers in Cambridge and adding hundreds of jobs. The leasing deal, one of the biggest in the Boston area in recent years, will allow the Internet data company to put most of its employees into one building, making it a major tenant in the biotech and high-tech hub. Akamai’s leases on 500,000 square feet at several locations expire in 2019, and while it had mulled moving out of Cambridge, the company in March said it wanted to be in Kendall Square. The Massachusetts Economic Assistance Coordinating Council is slated to vote on the tax credit proposal on Wednesday, according to a council document provided to the Globe. Neither the company nor the state has disclosed the amount of money involved, though state documents show the deal includes $136 million in private investment. On Friday, Erica Chapman, Akamai’s vice president of corporate services, said the company has signed a letter of intent with real estate developer Boston Properties for a long-term lease to fill the 454,000 square feet of office space that will be built at 145 Broadway. The four-story office building on the site is slated for demolition. “We’re trying to be as consolidated as possible, in Kendall,” said Chapman. “There were only a few options, and this was the one we most preferred.” Chapman said Akamai expects to lease additional space in a nearby building. Akamai’s proposed development may put further upward pressure on Kendall Square rental prices, already among the most expensive in the United States. While big companies like Akamai can afford the area, many startups are moving to neighborhoods in Boston with cheaper rents. “This is probably one of the dominant biotech, high-tech research areas in the country,” said David Begelfer, chief executive officer of NAIOP Massachusetts, a commercial real estate development association. Begelfer said another nearby property, the US Department of Transportation’s Volpe Center, is being offered for redevelopment and is attracting intense interest. Akamai employs about 1,700 workers in Cambridge, after hiring 200 workers in the past 18 months. The company is committing to add 700 jobs and retain its existing workforce in exchange for the tax break. The timetable for the employment pledges hasn’t been disclosed. Chapman said Akamai’s employment growth has averaged 10 to 15 percent in recent years. Akamai pioneered the business of Internet content delivery, using its own global network of servers to quickly move vast amounts of other companies’ data over the Web. It also provides data security services to protect its customers from denial-of-service attacks and other cyberthreats. But Akamai is facing tough challenges as more large companies use their own global networks to handle their traffic, or switch to rivals like Amazon.com, Google, and Comcast. “We’re seeing it in their financials quarter after quarter,” Rayburn said. “They’re not growing as fast as they used to . . . they don’t have the margins that they used to.” Still, Akamai’s revenues grew 6.8 percent in the first six months of 2016, to $1.1 billion, while net income for the period increased 2.4 percent to $148 million. But Akamai’s quest for tax credits is likely to reopen the controversy over the use of taxpayer dollars to subsidize the expansion of for-profit companies. Several such deals have gone awry. The Canton biotech company Organogenesis Inc. received a $7.4 million grant from the Massachusetts Life Sciences Center in a deal that was supposed to create 500 jobs. The jobs never materialized, and Organogenesis never refunded the money. Solar power company Evergreen Solar Inc. of Ayer got $58 million in state aid, only to end up in bankruptcy. Todd Wallack of the Globe staff contributed to this report. Hiawatha Bray can be reached at hiawatha.bray@globe.com. Follow him on Twitter @GlobeTechLab.